Corruption exposed. : Global warming - the myth! Global warming, refers to an increase in the temperature of the air surrounding the earth. And this is exactly as it has been described since the very first mention of such. Although, more recently, Global warming (now referred to as climate change), has been described to mean weather extremes of both hot and cold. Clearly the proof is in the title 'warming' as in getting hotter. But then, liberals never really were all that bright. The myth of Global warming is reported to date back as far as the 1850's. When, supposedly, the temperature of both the air and the sea began rising. Since then, humans have been blamed for the lie that is global warming. In the United States, the interest in climate change was extremely low. That is until after 1988 drought, since then the interest has significantly raised over the years, as global warming received the blame for the drought. Not so amazingly, England followed in America's footsteps, when in 1988 the British press, stimulated by the lies of Margaret Thatcher (in her attempt to promote nuclear energy and dismantle the coal industry), began publicising the risks of climate change. Thatcher orchestrated action against alleged man made climate change in 1988. The Kyoto Protocol, which was originally embraced in 1997, is aimed at fighting global warming. And is a protocol to the United Nations Framework Convention on Climate Change (UNFCCC). The UNFCCC, has the goal of achieving the "stabilization of greenhouse gas concentrations in the atmosphere at a level that would prevent dangerous anthropogenic interference with the climate system." Although the protocol was recognised in 1997, it wasn't fully established until 2005. Under the protocol 37 (Annex) countries promise to reduce the production of four greenhouse gases (carbon dioxide, methane, nitrous oxide, sulphur hexafluoride. And two groups of gases (hydrofluorocarbons and perfluorocarbons). Knowledge of global warming became much more wide spread, after Al Gore's 2006 'an inconvenient truth' documentary. Although Al Gore began with mere presentations before the making of this fictitious film. The film was released under the guise of informing the world of climate change. The documentary an inconvenient truth, is nothing more than propaganda. Portraying false truths about the non existent effects of global warming in the present and future - tied in with some irrelevant personal stories! But Al Gore pretty much kick started the wide spreading of the myth to the unsuspecting public. Over the years, the global warming propaganda has been forced on people through Schools, TV and other news sources. A few years ago, the global warming fabrication began to prey on the hearts of animal lovers. People were led to believe that polar bears were dying out due to the ice caps melting. The fairytale was that polar bears were drowning due to being unable to find land. Or were dying of starvation for much the same reason. Polar bears were said to be at risk of extinction. And were listed as endangered species. However, it has recently been proven that the number polar bears across the Arctic has rapidly increased - from the 8,000 to 10,000 estimated to be in existence in the 1960's - to the 20,000 to 25,000 in existence in 2008, and is in the same number up to today. So much is this increase in polar bears, that they are struggling for food and in some cases turn to cannibalism - because there are simply too many of them to survive. It was even mentioned that the number of polar bears would have to be forcebly decreased. In 2008, some scientists predicted that the North pole would be ice free in the summer. The above grapth, quite mistakenly shows that the Artic sea ice extent only 10 per cent greater than this date in 2007, and the second lowest on record. This grapth is completely and deliberately wrong! 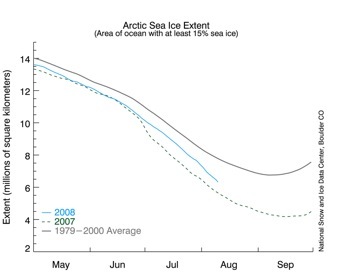 In the summer of 2008, the Artic ice made an excellent recovery. NASA Marshall Space Flight Center data shows 2008 ice nearly identical to 2002, 2005 and 2006. This image clearly shows an increase in Artic ice. With some areas being surrounded by as much, or more ice than as far back as the 1980. 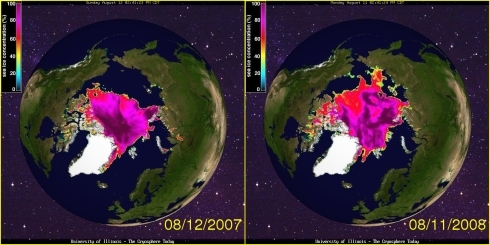 The increase in Artic ice from 2007 to 2008 was 30%. Much more than the 'official' grapth portrayed. This information is based on images from the University of Illinois' Cryosphere. Artic sea ice from 2009 to 2011 has increased 70 Trillion cubic feet. And the Artic ice sheet has substantially thickened. "The ice thickness scale color, dark blue, corresponds to about 1.5 meters, or about 5 feet. The color green represents about 3 meters, or about 10 feet. The estimated area that has changed from dark blue to green measures approximately 500,000 square miles based on approximated Google Earth ruler measurements (1,500 miles length by a bit more than 300 miles width, on average – call it 333). 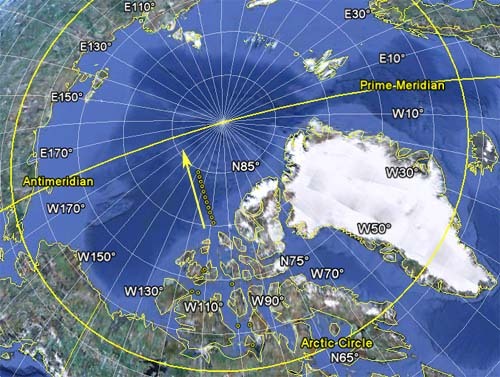 might as well round it to 70,000,000,000,000 cubic feet" - Prepare for the mini ice age. It's global warming, you know?! So why the global warming lie? Lets face it, how else can the evil money grabbing companies/government increase our home bills and taxes?! They blame humanity, taxing us until we bleed. The government and energy companies easily get away with their criminal act as well. Because far too many people don't understand the ice measurements, can't be bothered to find out for themselves, or foolishly believe the lies they're told. It's not difficult to estimate the ice increase. And the information is so readily available. Don't listen to the official fairytale. Think for yourself. Research it yourself!